Personally I do fried chicken in several ways. I want to share 3-4 ways to fry chicken. This one makes crisp coating on chicken. I am using self raising flour in this recipe. If you don’t have self raising flour, add two teaspoons of baking powder to each cup of plain flour to convert plain flour into self raising flour. 1. Mix with chicken and spices and let it marinates for at least ½ hour. 2. Mix eggs, salt and pepper and take each chicken piece. Deep into egg and roll in self raising flour. 3. Place the pan with oil on medium heat and fry the chicken pieces. Don’t crowd the pan. 4. Fry them on medium heat until it becomes golden brown. 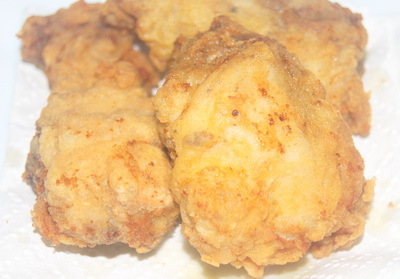 Take fried chicken from oil and put on paper towel. 5. Serve hot fried chicken with fried rice or as a snack. I liked your Kolijar Singara recipe.Keep up the good work. Thank you. I have 1 daughter. You can give sandwich, pizza, bread pizza, shawarma kabab, chicken fry, French toast, cup cake, crush bun, stuff bun , home made burger, chicken popcorn and list goes on. most of already in my site and I will share more recipe for kid’s tiffin box soon.